But whoever it is and by however much, they’ll be the champions. There’s one every year. When do you suppose it might be Gonzaga’s turn? 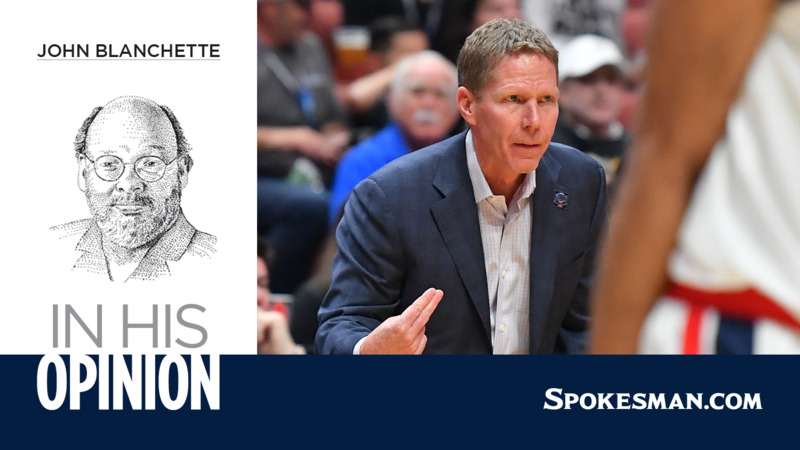 It is easy to say – or scold – that winning an NCAA title need not be an all-consuming beast for the Bulldogs and their peeps, and certainly coach Mark Few tries from time to time to beat back that very mentality among the, uh, all-consumed. But it’s just as true that even among the program’s players, winning it all is viewed as The Step That Needs Taking, and that coming up short of the Final Four this year felt like a kneecapping. Now comes the segue from March Madness to April Angst for the Gonzaga cortege – waiting for the other Nike to drop on who among the Zags are going all-in on the NBA draft, who will be checking things out and who can be counted on to return. And over the transfer market, graduate and otherwise. And over how ready Gonzaga’s considerable recruiting class is for prime time. And, for more than a few, over whether they just watched a window of opportunity slammed shut. Which seems pretty fatalistic, all in all. But it remains that the deal could not be closed this basketball season by a team with two lottery-or-not players in the lineup and a fifth-year point guard. They’re damned handy with a chisel over at GU, but not every hunk of marble comes out looking like David. Still, this is no law-of-averages proposition, no craps table karma. There is always the opportunity to make more, well, opportunities. There are also cautionary tales. It has not been a decade since Butler got itself to back-to-back NCAA championship games, losing one on a missed shot every Duke hater still imagines going through the net. Those Bulldogs were somewhat Zagish, high-major goods from a midmajor league. Butler has been as far as the Sweet 16 exactly once since. And this year, they were 16-17 and tied for last in a somewhat sketchy Big East. They’re on their third coach since the one who took them to those Final Fours decided to exercise his genius in the NBA, and their second league. None of that is very Zagish – not the coaching turnover, for sure, which is probably the key to it all. And maybe the cure to any bout of fatalism can be found in just how wide the Bulldogs managed to crack this recent window of opportunity. Gonzaga has had five 30-win seasons in its history – four of them in the last five years. That’s 165 wins during that stretch, a 19 percent bump from the previous five-year hitch and a 23 percent gain over Few’s first 15 years in charge. Those have been accompanied, of course, by five straight trips to the Sweet 16, three Elite Eights and a Final Four – an unprecedented stretch in Gonzaga’s still-recent evolution. Something’s changed, and it’s on display every game night. Of the 21 players who might be considered central to GU’s success in that span – the rotation guys – only six played on more than two of those five teams. Eight players enjoyed just a single season of this latest run inside the run. Roster continuity apparently ain’t what it used to be. And the Zags have been getting it. What suggests that would stop? If you include the current draftables, Brandon Clarke and Rui Hachimura, the Zags will have had six players in the last five years go on to wear an NBA uniform. You could flesh out a 10-man roster with borderline talents and possible draftees. It makes for some tricky management. Few faces it now with the possibility of a wholesale makeover. But he’s faced it before. Whether it’s losing players to early entry or gaining them through graduate transfer – a tool that the NCAA is about to legislate to smithereens – the Zags have thrived through change and challenge. And now Few has hooked up a recruiting class ranked by 247sports.com as No. 5 nationally. They’re kids. Don’t be booking any Final Four flights yet. But keep your eyes on that window. Published: April 6, 2019, 9:32 p.m. Updated: April 6, 2019, 10:35 p.m.